Please email: events@cdfb.org.uk with information about your events. Your email will be forwarded to Tom for prayer cover, Debby for posting on the CDFB Facebook group and John for posting on the website. If your CDFB event requires CDFB insurance please contact your Regional Coordinator. Venue: Christchurch Bayston Hill, Glebe Road, Bayston Hill, Shrewsbury, SY3 0PZ. There will also be a time of worship before we start the prayer time for the different items. For anyone who are on medication which prevents them from fasting, they will be allowed to bring some fruit to take, there will also be water on hand for those who need a sip during the intervals. Please come and join us, and bring a verse of scripture, or something from the Lord that will bless us. There will be a book to write down anything that comes to mind, you may bring flags, staffs, or a piece of music if you feel the Lord lays on your heart to bring to encourage us all. Workshop led by Judith Scott and her daughter Rebecca Magee. Venue: St Alban's Church Tilford Road HINDHEAD Surrey GU26 6PD. This day will explore Scripture through meditation and movement. There will be chance to experience two workshops on the same theme over the day, one led by Judith and one by her daughter, Rebecca. No previous experience is required at all. Many who attend these workshops will be first timers but then return time and time again! Come to receive and find a new way to connect with, talk to and spend time with the Lord! 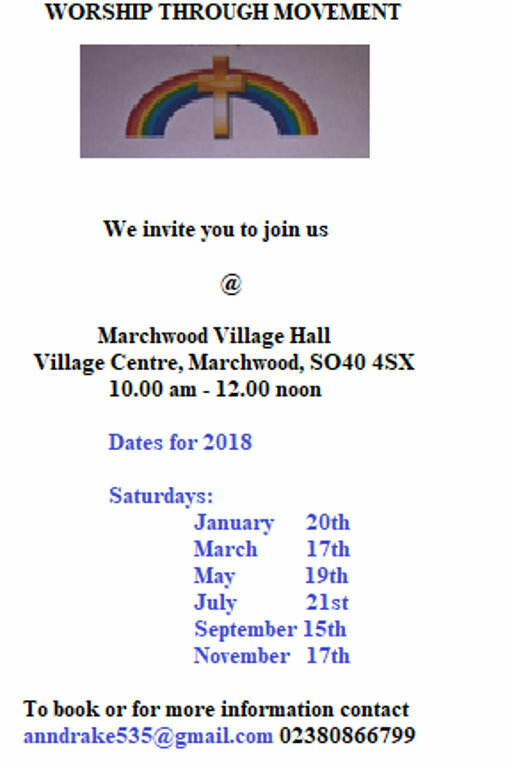 All welcome - ages usually range from under 30s to over 70s! Please bring your own packed lunch. Refreshments will be available throughout the day. For more information, or to book a place please see the flyer. Venue: Thornbury Baptist Church Bristol BS35 2EG. Time: 10am to 4pm (drinks provided, please bring lunch). In a fast paced, busy world, time taken to breathe, pause and notice is not always available in our day to day. This workshop will awaken our awareness to our bodies, as we take time to step away from the busyness of the world around us. Through group and individual interaction we can learn to uncover the secret place to find our grounding and attune to the rhythm of our Heavenly Father’s heart beat. Price: £10 CDFB members, £13 non-members (includes £3 day membership). There are 3 trimesters and students can start at any one of them with one or more subjects. Trimesters are 12 weeks long. Date: Saturday, 27 April 2019. 10am Registration to 4.00pm. Venue: Southcroft Church, 276 Mitcham Lane, Streatham SW16 6NU. In this workshop we will explore the theme of the Scripture in a variety of creative and reflective ways. All welcome (age 15+) and no dance experience necessary – just a willingness to move into worship. Please bring a packed lunch, drinks will be provided. The cost for the day is £10 payable at the door. Payment in advance is not required but to book your place please see the flyer for contact details. 3 Streams to choose from; Movement, Rhythm or Spirit-Led Outreach. Venue: Whitemoor Lakes, Barley Lane, Lichfield, WS13 8QT. A safe place to explore movement and dance in prayer & worship. Drawing closer, moving deeper through meaningful movement, dance, fellowship and Creator’s creativity. 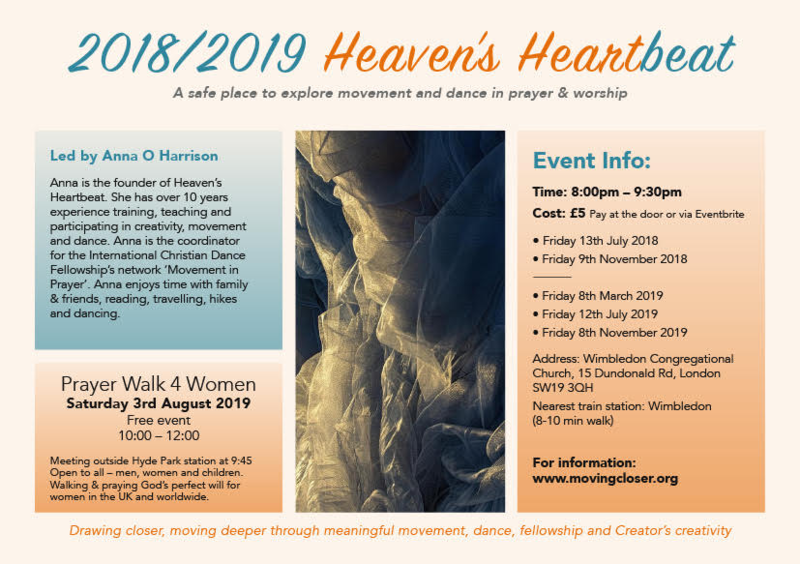 All are welcome to come and explore drawing closer to God through movement and dance. Each evening will include biblical teaching and the opportunity to move & dance. Please note: new venue and new cost. Venue: Wimbledon Congregational Church, 15 Dundonald Road, London. SW19 3QH. Anna O Harrison is the founder of Heaven’s Heartbeat. She has over 10 years experience training, teaching and participating in creativity, movement and dance. Anna is the coordinator for the International Christian Dance Fellowship’s network ‘Movement in Prayer’. 10 am until 12 noon and afterwards for coffee and biscuits or bring your own lunch. Express love for Jesus though Christian dance. No need to be very fit. Children must be with an adult.